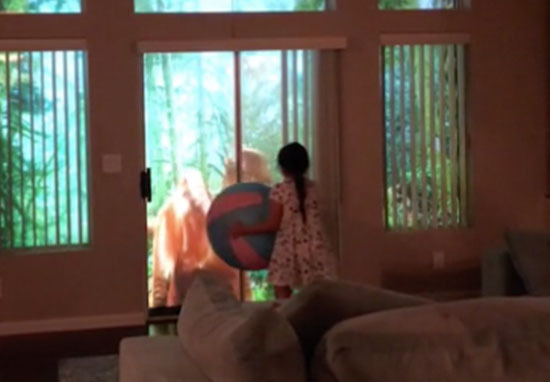 A dad set up projectors to surprise his daughter with a real-life Jurassic Park experience right outside the windows of her house. Knowing everything that seems to go wrong in a Jurassic Park-style life, being emerged in that world doesn’t seem like the most appealing idea at first. Once you learn that the dinosaur-filled area will be merely a projection however, the idea gains a lot more promise. A Las Vegas dad confirmed this idea is in fact extremely epic. He transformed the windows of his house to show dinosaurs roaming around in luscious undergrowth, and it looks incredible. Stagehand Lyle Coram set up projectors, screens and lighting to create the scene and surprise his seven-year-old daughter, but I think Lyle’s work will impress people a lot older. Lyle’s daughter Shelby seemed mesmerised by the undergrowth that has emerged outside her house, waiting patiently for huge dinosaurs to make an appearance at the window. The girl even wafted a ball around in front of one of the dinosaurs – and, in a feat of visual effects that will never fail to amaze me, the dinosaur seemed to interact, bobbing its head back and forth as if looking at the ball. A whole range of otherwise-extinct creatures featured in the display, including a T-Rex which performed a very Jurassic Park-like inspection of its surroundings, the beast lowering its head down to peer through the window. The T-Rex didn’t seem to go down so well with the young girl, who ran away rather than trying to play ball with the carnivorous dinosaur. Lyle apparently took only an hour to set up the whole display, and wasn’t worried about frightening his daughter, explaining her birthday is on Halloween so she’s ‘used to scary things’. 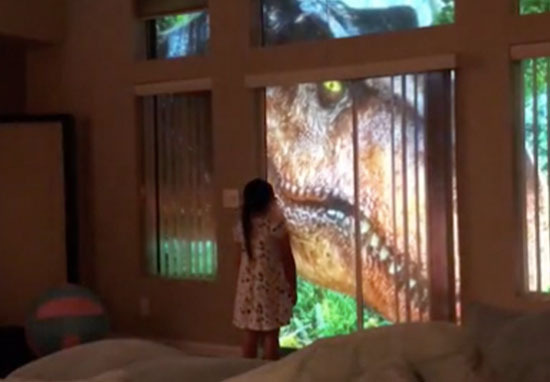 I’m using DINOSAUR ENCOUNTER from AtmosFX .com and a large rear screen outside the house and projecting into the house with a short throw projector. Lyle’s dinosaur adventure isn’t the first project he’s done for Shelby, as earlier this year the father transformed his daughter’s bedroom into her very own Disneyland. The 48-year-old worked for 3 months to create the perfect Disney-themed room, setting up a castle and drilling holes in the ceiling to add in fibre optic lights, which gave Shelby her very own nightly fireworks display. And to think, my dad’s idea of DIY is replacing old shoelaces with dental floss. While it sounds like a lot of hard work, the father explained the project and said the work wasn’t that unusual to him. We started with the paint and carpet and decided to paint the sky on her ceiling. That’s when I thought it would be cool to have fiber optics for the stars, then I thought lightning would really be awesome. After doing that we got Shelby the castle for Christmas and put it in her room. That’s where the fireworks idea came from. I’m a stagehand with IATSE LOCAL 720 and I work at Paris and Bally’s Las Vegas, so this type of work comes naturally to me. Excellent work, Lyle. Dads everywhere have just had their DIY skills put to shame.